"Ryan used to say that he'd 'rather wear out than rust out. If he could script the end of his life, I don't think he could have wanted it any better. Not many people get to end their life doing the things they love, and he did." The tragic death of Ryan Shay in the first 10k of the race put everyone in the running community at a loss for words. Our thoughts and prayers are with his wife and family. Ryan Shay Photo Gallery: Alicia Shay writes in to thank the running commmunity for their support and kind words in this time of need. Plus she shares some of her favorite photos with Ryan. Official Ryan Shay Remembrance Thread: Joe Shay, Ryan's dad, wrote in to give his thanks for all the kind thoughts and prayers. With a dad like that you see why so many people liked Ryan. *Lengthy Article on Ryan in His Hometown Paper Ryan's dad made sure the author sent us this one. *From Ryan's Hometown Paper: Ryan Died Pursuing His Dream From his hometown paper as well. *Tim Layden of Sports Illustrated Looks at Ryan Shay's Death The article is a good one. It says some runners like Meb and Culpepper admit they could never push like Ryan. Surprisingly some of these top guys say Ryan's death has them wondering how hard they will push themselves in the future. Plus it reveals, Dathan Ritzenhein had to tell Ryan Hall and Brian Sell of Shay's death. 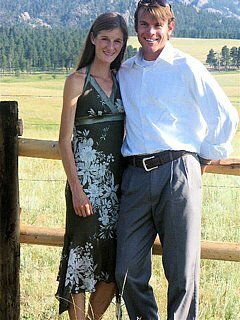 *Lauren Fleshman Blogs on Ryan Shay's Death Interesting read as Lauren woke up in a cold sweat right aroudn the time Ryan died. She advocates we all wear gold bands or ribbons in honor of Ryan. *Lengthy Ryan Shay Piece in NY Times With Photos from the track in his hometown where the town is having a candelight vigil each night. *Ryan Shay Being Remembered in Central Park Photos from former Oregon runner Ben Andrews. *Shay's Death Bewilders Loved Ones Everyone including his former coaches Joe Piane and Joe Vigil are bewildered by Shay's death. Abdi revealed a touching anecdote of how he warmed up with Ryan and what Ryan's last words were to him. Shay's funeral will be on Sunday in Michigan as Shay's HS and Piane and Vigil will speak. *NY Times: Still No Answers In Shay's Death An autopsy was performed on Sunday was inconclusive. Full results won't come out until later in the week. Ryan's father speciifically asked for toxicology tests to be performed so he could prove that his son never used performance enhancing drugs. *George Vescey Column: After a Death, Time for Life and a Race Paula Radcliffe expresses her condolences after winning.